We set out and almost immediately into the hunt Hera locked up on point. She was in the middle of a stand of birch and aspen and staunch. This usually indicates she found a woodcock. I walked along the stand of cover to a gap in the brush, several yards ahead of where Hera remained on point. I was a little apprehensive as in her second and third seasons, Hera was prone to breaking point and bumping the bird before I could walk it up. This season (her fourth season), I am happy to report she remains staunch on point consistently. I always walk around Hera and approach her point head on as opposed to walking it up from behind her. This way, I get the bird in a squeeze play and more often than not a better opportunity for a shot. Woodcock often hide under cedar trees or clumps of cover and if you approach from behind the bird typically flushes on the other side of the cedar or the clump of cover, giving you no shot. Sure enough, this time I flushed the bird a few yards to the right of where Hera stood on point. It was there for some time before she found its scent and moved about. I mounted my 20 gauge Franchi Instinct SL and shot once at the bird, missing spectacularly. We continued our sweep through the stand of birch and aspen and in short order Hera locked up on point. I am certain it was the same bird. It flushed with less zeal this time, flying straight away and close to the ground. I mounted the gun and fumbled with the safety, just as I had Sunday morning. Only this time I did not get the shot off and the bird escaped, probably making it the luckiest woodcock in the Ottawa Valley that afternoon. After my laughter subsided, I took a moment to experiment with releasing the safety on my new Franchi shotgun. I find it is quite different from the kinds of tang safety I am used to on the American brands of shotguns I use, e.g., Browning, Remington and Winchester. With these brands I find I can work the tang safety forward and backward easily with my thumb resting on top as pictured in the first photo below. This is not the case with the Franchi. To properly release the safety I need to place my thumb behind and push forward as shown in the second photo below. If I place my thumb on top of the safety when I try to release it my thumb slips off and the safety remains engaged. Now that I understand how the safety works on the new Franchi, I trust there will be no more (at least fewer) bungled shots. I used my time in the field this afternoon to thoroughly explore Schäfer’s Wood with Hera. I found a trail off the forest road that looks promising. We walked it up a bit, but no birds were found. We walked up the trail that leads to the ruin of the old deer stand and as I shot some video footage, commenting on how one could expect to find grouse in the area, Hera locked up on point. I walked up her point and a grouse flushed in thick cover. I caught a fleeting glimpse, not enough to risk a shot and the grouse made goo its escape. As we made our way back to the forest road I found a path heading toward the edge of the beaver pond. We followed the path and found a ladder stand and bait pile situated at the edge of the cattails bordering the beaver pond. An optimistic deer hunter set up the ladder stand and put out bait in hopes of attracting deer, likely for the archery season that opens October 1st. Schäfer’s Wood looks promising as grouse and woodcock cover so we will return on subsequent hunts. It is a mix of birch and aspen runs, pines and cedars. There are also a few berrying shrubs. The cover provides food and shelter for grouse and woodcock making it suitable habitat. Still, given the dry conditions this season, there is no guarantee we will turn up many woodcock. In addition, grouse in the Marlborough Forest are not the “fool hens” you find in norther Ontario: the grouse that flush underfoot and fly into the nearest tree. Here in the Marlborough Forest grouse behave more like pheasants in that they run ahead of the dog and often flush wildly before the dog locks up on point. 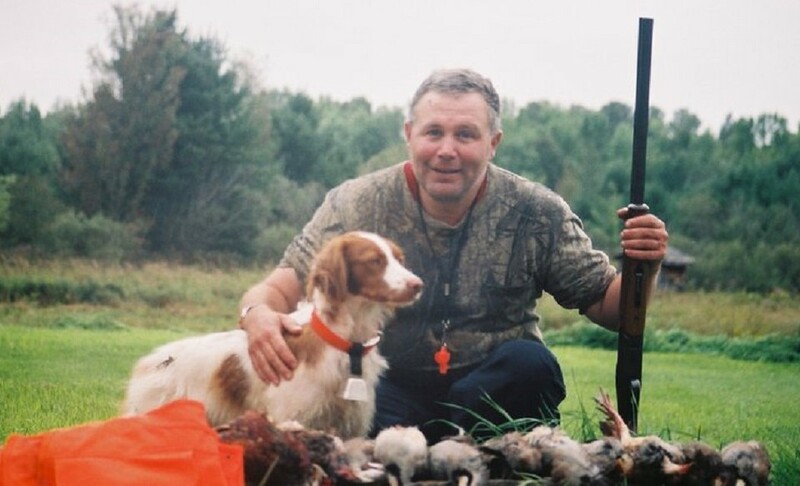 You are probably better off hunting grouse in the Marlborough Forest over a flushing breed of dog. That said, Hera and I do our best and have fun in the process. We completed our sweep of Schäfer’s Wood walking to the edge of the beaver pond where Hera waded in to cool off. As I stood looking across the pond at the sunset, two wood ducks flushed in the distance. I called it a day at 6:50 pm, half an hour before the end of legal shooting time. It gets dark before shooting time ends and we completed a full sweep of the cover. Our next expedition to Schäfer’s Wood is slated for Friday morning. We will see what fortune brings us this time.